This is the best pickup for you if you want the Swiss Army Knife of trucks. Whether you’re looking for a basic rig to take you to and from the jobsite or a modern land yacht with the creature comforts of a BMW, Ford makes an F-150 that should suit your needs. Model-year 2018 marks the mid-lifecycle refresh for this hearty half-ton. Changes include revised styling, new engines (including a first-ever diesel), additional safety features, and expanded availability of a segment-first 10-speed automatic transmission. Demand for full-size trucks remains strong from professional and recreational buyers. 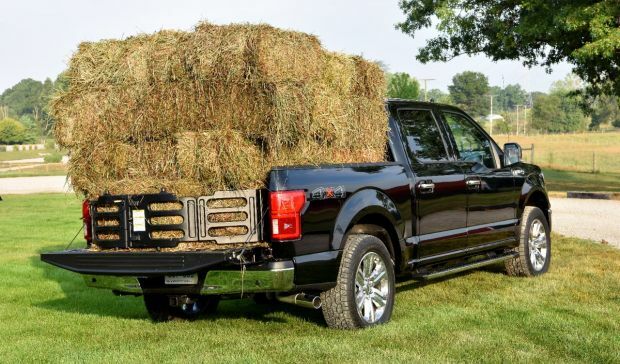 Ford’s F-Series line comprises the half-ton-payload F-150 and heavier-duty Super Duty F-250, F-350, and F-450. It’s been America’s top-selling vehicle line for more than three decades. In 2017, nearly one in 20 new vehicles purchased was an F-Series – nearly 900,000 trucks in all. This review focusses on the most popular iteration, the F-150, which is depending on its 2018 refresh to counterpunch fully redesigned, model-year-2019 versions of its top two rivals, the Chevrolet Silverado 1500 and Ram 1500. Better off going for the 2018. You’ll get the most up-to-date version of the F-150 — styling, drivetrains, safety features – and sidestep paying more for what’ll be the essentially unchanged 2019 model. Indeed, the next fully redesigned F-150 is due for model-year 2020, making notable model-year-’19 updates quite unlikely. The 2018 cab and cargo-bed configurations should carry over for 2018, as should trim-level designations. Ford offers the F-150 as the Regular Cab two-door, the extended Super Cab with half-sized rear-hinged back doors that don’t open independently of the fronts, and longer SuperCrew crew cab with full-size, front-hinged rear doors. Available bed lengths are 5.5, 6.5, and 8 feet, depending on cab type. The ’18 F-150 is available with four gasoline V-6 engines, three of them turbocharged; a turbodiesel V-6; and a gas V-8. The grade structure starts with the base XL model and ascends through volume-selling XLT and Lariat; luxury-themed King Ranch, Platinum, and Limited; and off-road-ready Raptor. The Raptor comes only with four-wheel drive (4WD); all other models are available with rear-wheel drive or 4WD as an option. Styling: Formerly extending a decade or more, today’s pickup-truck lifecycle now mirrors that of most passenger cars: full redesigns every six to eight years with a significant refresh around the halfway mark. That’s true for the current-generation F-150. It debuted for the 2015 model year with a redesign that encompassed more than just new styling, drivetrains, and features. Ford engineers altered the paradigm by which full-size trucks are built, retaining steel for the frame but switching to lighter weight aluminum for the body and cargo bed. Rival General Motors asserts the F-150’s body and bed dent more easily than steel are more difficult and costlier to repair. But the aluminum-bodied F-150’s segment-topping sales suggest most buyers disagree or don’t care. The 2018 refresh doesn’t change the basic body but refines the styling. Seven new grilles are available, depending on model grade. All share a horizontal, twin-bar motif meant to accentuate the truck’s wide stance. Revised “c-clamp” shaped headlights gain LED daytime running lights with full LED illumination available on higher-end trim levels. The two-tier design to the front windows returns. This stylish touch also serves a purpose: The front half of the window sill is slightly lower so it doesn’t obscure the side-view mirrors. New wheel designs in sizes ranging from 17 to 22 inches also return, and Ford is stamping “F-150” into the tailgate of XL, XLT, and Lariat models. The interior sees fewer changes, but that’s not a bad thing, it was already a model of form and function. Newly available are a high-end B&O Play audio system and built-in 4G LTE connectivity that can turn the truck into a rolling Wi-Fi hotspot. Most models are available with Ford’s excellent Sync 3 touchscreen infotainment suite that now includes support for Apple CarPlay and Google Android Auto. Most functions are easy to spot at a glance and can be operated while wearing thick gloves, though operating the available heated steering wheel requires interacting with the touchscreen – a bad design choice borrowed from Fiat-Chrysler. It would also be nice if the screen were a little bigger. Much more pleasing is the instrument panel. Upper-grade F-150 models offer a comprehensive gauge cluster that can show much more than the usual vehicle and engine speeds, engine temperature, and remaining fuel. A customizable LCD panel between the speedometer and tachometer can display a variety of useful data, depending on how you’re using the truck, such as trailering, idle hours, and more. Materials quality ranges from durable in the XL to high-class in the Platinum and Limited to rock-crawler ready in the Raptor. The leather-adorned Platinum and Limited give off a true country-club vibe. 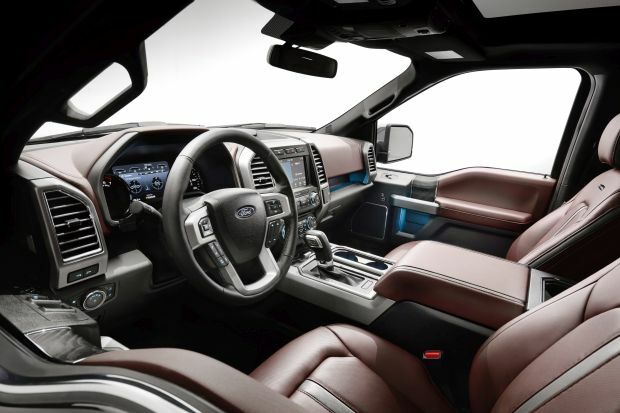 The front seats are supremely comfortable in any F-150, with pillow-like cushioning and available built-in massage to soothe sore backs after a tough day on the job. The rear seats in the Super Cab are harder, and legroom is in short supply. Further, the rear-hinged doors are harder to close. Not surprisingly, most F-150 buyers choose the Crew Cab. It delivers limousine-like space in back. Its seating surface is much more accommodating and offers optional heating for the outboard positions. Owners with small children take note: One of the F-150’s available safety features is an airbag mounted to the rear shoulder belts. This makes said belts quite a bit thicker than standard, so feeding them through a front-facing booster seat is slightly tricky. Bountiful in-cabin storage allows for easy transport of small items, and even moderately sized laptop computers inside the center console. Outside, the available integrated tailgate step and grab handle are still the best ways to access the bed of any truck on the market, full-size or otherwise. Mechanical: While the F-150’s basic engineering is unchanged for 2018, Ford makes significant revisions under the hood. XL and XLT grades get a new standard V-6, a 3.3-liter with 290 horsepower and 265 pound-feet of torque. It replaces a 3.5 that had 282 and 253, respectively. 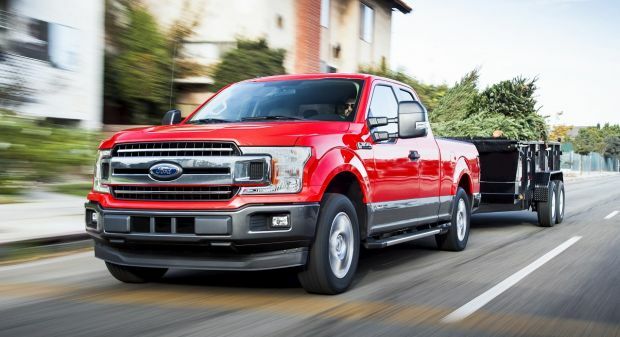 The automaker also updates the F-150’s available 2.7-liter turbocharged V-6 with new internal components that increase torque to 400 pound-feet from 375; horsepower is unchanged at 325. The 5.0-liter V-8 returns, now at 395 horsepower and 400 pound-feet of torque, increases of 10 and 13, respectively. The turbodiesel is a 3.0-liter V-6 with 250 horsepower and 440 pound-feet of torque. Unchanged is the F-150’s top-line engine option, a 3.5-liter twin-turbo V-6 rated at 450 horsepower and 510 pound-feet of torque in the Raptor and 375 horsepower and 470 pound-feet in other models. The 3.3-liter V-6 teams with a 6-speed automatic transmission. All other F-150 engines use a 10-speed automatic. The 10-speed is a revelation that mates perfectly with all the gasoline engines (we’ve not yet tested the diesel). It shifts with the promptness of a dual-clutch automatic but with none of the bogging or surging that can happen with a dual-clutch transmission. The new 3.3-liter V-6 is a serviceable engine and although it can tow up to 7,600 pounds, the 2.7-liter turbo V-6 is a better all-around performer. It can tow up to 8,500 pounds and should provide more than enough muscle for most owners. Power comes on strongly with no perceptible turbo lag. This and the stronger 3.5-liter engine are so smooth (and quiet, too) that we’ll go so far to say they render the V-8 superfluous. The twin-turbo 3.5 actually boasts the F-150’s highest tow rating, 12,100 pounds, 1,000 pounds more than the V-8. There’s nothing wrong with the way the V-8 performs. It runs neck-and-neck with similar engines from rivals, but it is notably louder than either gas V-6, both at idle and during acceleration. It can run on E85 Ethanol-blended fuel, but it’s strongest asset is to satisfy pickup loyalists who dismiss the idea of driving a big rig with fewer than eight cylinders. Still, we would encourage those folks to give the turbo V-6s a chance; you’ll be impressed. F-150’s ride and handling are about what you would expect from a full-size pickup. There’s some rear-end skitter with an unladed bed, and the steering is on the slow side, making the truck feel more ponderous than the similarly sized Ram 1500. Ford offers this truck with a strong set of driver-assistance features, including blind-spot alert with rear cross-traffic detection, radar cruise control, forward-collision warning, and lane-departure alert with automatic steering correction. We found the latter feature to be too intrusive, at least partly due to how wide the truck is. Fortunately, you can disable this function entirely and steer for yourself. Features: Some features require specific bed and cab configurations as well. The XL grade is so basic you can order one with manual windows and locks. The XLT adds power accessories, aluminum wheels, and a basic version of Ford Sync. The Lariat adds the 2.7-liter V-6, keyless access with pushbutton engine start, leather upholstery, heated and ventilated front seats, driver-seat memory, dual-zone automatic climate control, and Sync 3. King Ranch and Platinum models include the V-8 engine, remote engine start, unique exterior trim, upgraded B&O Play audio system, trailer brake controller, heated rear seats, imbedded GPS navigation, windshield wiper de-icer, and genuine wood interior accents. The Platinum gets 20-inch wheels versus 18s on the King Ranch. The Limited includes the 3.5-liter V-6 engine, dual-panel sunroof, unique exterior and interior trim, and blind-spot alert with rear cross-traffic detection. In terms of base prices, the Raptor resides between the Lariat and King Ranch, but in terms of amenities, it’s closer to the XLT. It includes the high-output 3.5-liter engine, unique cloth upholstery, off-road suspension, electronic locking rear differential, hill-descent control, and Ford’s Terrain Management System with six driver-selectable modes. We won’t list every possible configuration – there are dozens — but suffice to say, the F-150 covers a large portion of the pricing spectrum. At the bottom end, a rear-drive Regular Cab XL has a base price of $29,100, including $1,395 destination fee. Swing to the opposite side, and the 4WD Limited crew cab starts at $65,670, and with options you can get one precariously close to $70,000. With so many different combinations, we’ll only cover the highlights of content availability. Options for the XL include the $2,055 Package 101A (power windows and locks, cruise control, CD player, basic version of Ford Sync), Chrome Appearance Package ($775: 17-inch aluminum wheels, body-color front fascia, chrome bumpers, fog lamps), Sport Appearance Package ($775: similar to the Chrome Appearance Package but with body color bumpers), and STX Appearance Package ($1,995: 20-inch aluminum wheels, mesh grille, fog lamps, rear window defroster, support for Apple CarPlay and Google Android Auto, extra USB charging ports, unique upholstery). The XLT’s most significant option is a $2,100 package that adds a power driver’s seat, heated exterior mirrors, leather-wrapped steering wheel, power-adjustable pedals, satellite radio, Sync 3, and a Class IV trailer hitch. The built-in tailgate step with grab handle is $375 we would highly recommend spending. On the Lariat, a $1,585 package adds blind-spot alert with rear cross-traffic detection and trailer-tow monitoring, remote engine start, remote tailgate release, rear-obstacle detection, and power-folding exterior mirrors. Another $7,335 package includes all this plus leather upholstery, heated and ventilated front seats, heated steering wheel, memory driver’s seat, heated rear seats, power tilt and telescopic steering wheel, quad-beam LED headlights and LED fog lights, heated windshield wipers, B&O Play audio, and chrome wheels and exterior trim. A $3,750 package for the King Ranch nets the tailgate step, blind-spot alert, massaging multi-contour front seats, power running boards, rear seat belt airbags, rain-sensing windshield wipers, and 20-inch machined aluminum wheels. It has its own Chrome Appearance Package for $1,995. Hands-free parallel parking is $925 when ordered with the above package. Radar cruise control is another $1,250 for both this and the Lariat. The Platinum has a $2,540 package that includes lane-departure warning with automatic steering correction, surround-view camera, hands-free parallel parking, adaptive cruise control, and tailgate step. The Limited’s dual-pane sunroof is $1,295. You can order a Raptor with a $3,280 package that includes 10-way power heated front seats, leather upholstery, power sliding rear window, power-adjustable pedals, and Sync 3 with CarPlay and Android Auto. A $9,770 package includes all of the preceding plus upgraded axle ratio, B&O audio, ventilated front seats, surround camera, blind-spot alert, dual-zone automatic climate control, heated steering wheel, driver-seat memory, power tilt and telescopic steering wheel, and remote engine start. Lane-departure warning with steering correction, rain-sensing windshield wipers, auto high-beam headlights, and adaptive cruise control come in a package for $1,950. An exterior graphics package is $1,075, with a separate hood graphics package for $900. A carbon fiber interior package is $995 while an interior accent color package is $750. Engine selections for non-Limited and Raptor models range in price from $995-$2,895. Among the standalone extras for most models are 4WD ($3,495), certain paint colors ($395-$595), FX4 Off-Road Package with specific suspension tuning, underbody skid plates, and hill descent control ($770), trailer tow package ($995), 36-gallon fuel tank ($445), bed divided ($295), spray-in bedliner ($495), built-in loading ramps ($595), different axle ratios ($420-$470), a bed extender ($365), or a safe that fits in the center console ($329). At a $57,595 sticker price, a nearly loaded 4WD Lariat crew cab with the 2.7-liter V-6 is our best value pick for most recreational users. Incentives should drive the price down to the lower $50,000 range. Don’t count on much of a deal for the low-production, high-demand Raptor. Full-size pickup truck fuel economy has come a long way in the last 10 years. F-150’s EPA ratings are quite good. Models with rear-wheel drive rate 20/25/22 mpg city/highway combined with the 3.3-liter V-6, 20/26/22 with the 2.7-liter turbo, 17/23/19 for the 5.0-liter V-8, and 17/22/19 with the 375-horsepower 3.5-liter V-6. Four-wheel-drive ratings are 18/23/20 for the 3.3-liter engine, 19/24/21 with the 2.7, 16/22/18 with the V-8, and 16/21/18 with the 375-horsepower 3.5-liter V-6. Raptor models rate 15/18/16 mpg. The diesel V-6 achieves a segment-best EPA rating of 22/30/25 mpg with 2WD. With 4WD, it rates 20/25/22 mpg. For comparison, a 2008 Ford Edge midsize crossover received ratings of 16/24/19 mpg with front-wheel drive and 15/22/18 with all-wheel drive. Our 4WD Platinum crew cab with the V-8 averaged a respectable 18.0 mpg in suburban commuting. All gas-powered F-150 models use regular-grade 87-octane fuel. Certain versions of the 3.3-liter V-6 and V-8 can use E85 Ethanol. The diesel requires ultra-low-sulfur fuel, and it has a urea-based exhaust treatment system that requires periodic refilling. The next-generation F-150 is due for the 2020 model year. Expect it to continue using the current models’ aluminum-intensive construction. Ford plans to offer a gas/electric hybrid model as well.